The brief discusses the key messages that transpired during the Conference on Scaling held on 29─30 November 2018 at the Melia Hotel in Hanoi, hosted by CCAFS SEA, co-hosted by ACIAR and GIZ, and funded by a CCAFS Small Grant Cross-CRP Networking. The conference main points include: scaling up agricultural innovations takes place in complex systems of agricultural transformation; and sustainable scaling should build into “sustainable change at scale”. Koerner J, Woltering L, Uhlenbrock S, Ohmstedt U, Zeiske F, Sartas M, Theissen A. 2018. 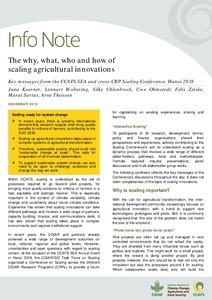 The why, what, who and how of scaling agricultural innovations: Key messages from the CCAFS SEA and cross-CRP Scaling Conference, Hanoi 2018. CCAFS Info note. Wageningen, Netherlands: CGIAR Research Program on Climate Change, Agriculture and Food Security (CCAFS).